In case you didn't know......The Packers won the super bowl!!!!!! O.k. so I am almost 3 months late with this information, sorry to spoil it for anyone who hasn't gotten to their dvrd recording yet, ha ha ha. Anyway, in our house this is a very BIG deal! For a man who was born in Wisconsin, and sometimes maybe forgets that he no longer lives there. 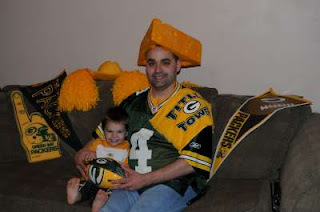 I am happy because Tim is happy and easier to live with :) so wooo hooo Go pack Go! 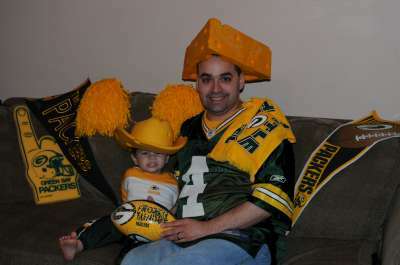 :) Of course, Tim decided to drag out SOME of his packer gear despite the fact that it is all packed away in boxes. He also thought Hayden needed in on the action. 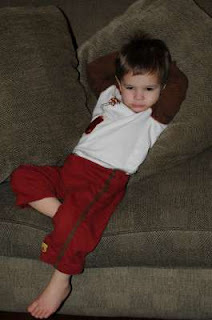 Hayden is one cute fan if I do say so myself, and now we will have to break out the razorback stuff. I don't think he likes the hat. We have been having some amazing weather lately, and some crazy freezing in April weather too. 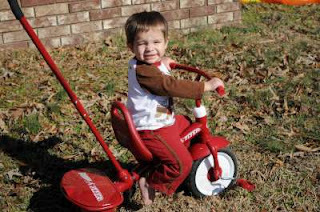 Hayden got this trycicle from his memaw for his birthday, but I asked Tim not to put it together until it got warmer outside. Well, we were at home one day and it was one of those amazing weather days, so I pulled out those fifty pieces and went to town on this thing, and I put it together all by myself.....and it hasn't even fallen apart yet! :) Hayden loves it and I do too. The adult bar is perfect height, and I have complete steering/speed control and it teaches him how to work the petals as I push. Then when he gets a little taller and can do it himself, I just remove the bar, it is awesome. 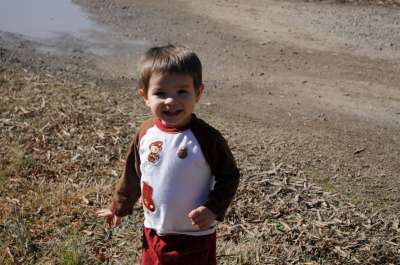 Hayden loves playing outside, especailly throwing rocks......we are working on that one. After a hard day of play it is time for a little rest. Ha ha, this cracks me up. He is his daddy's son!